Two recipes using a new, lunchbox-friendly fruit jelly, containing no added sweeteners or sugars, preservatives or weird ingredients. It's also vegan friendly, too. I received the juice pouches used in this recipe from Naturelly, along with a contribution towards the cost of this post. Thank you Naturelly for your support. You know, I always try to do the right thing with treats and my kids. I know first hand how sugar in ingredients can add up - all you see is added sugar in fruit juice, cereal, milkshakes - it's even in chips, ketchup and fish fingers for goodness' sake. So when I heard about Naturelly's Jelly Juice, I was intrigued. They told me the jellies were allergen free (no nuts, wheat, dairy, gluten and no gelatine, which also makes them vegan friendly). They also told me it had no added sugar or sweeteners. No artificial colours, flavours or preservatives. And that they were made from fruit juice that wasn't made from concentrate. Rather than using gelatine to give the jelly its alluring wobble, it's actually made with gellan gum, which is a natural dietary fibre found in lily plants. See? Vegan friendly. I mean, how could I not be intrigued? The jellies come in little handy 100g pouches, and you just twist off the cap and then snack away. I wanted to make a recipe that would suit little ones - and I ended up making two. OK, well I devoured the second one just before the school run, so the girls didn't get to see it, but the lollies went down a hit. All natural, and, I reckon, healthier than the supermarket alternative. A quick Google search revealed all sorts of weirdo stuff that potentially goes into commercial, shop-bought lollies. Things like dextrose (that's sugar), carrageenan (a stabiliser), glucose syrup (yep, more sugar) along with a list of flavourings and colourings. Who wants dye in their lollies? Not me. 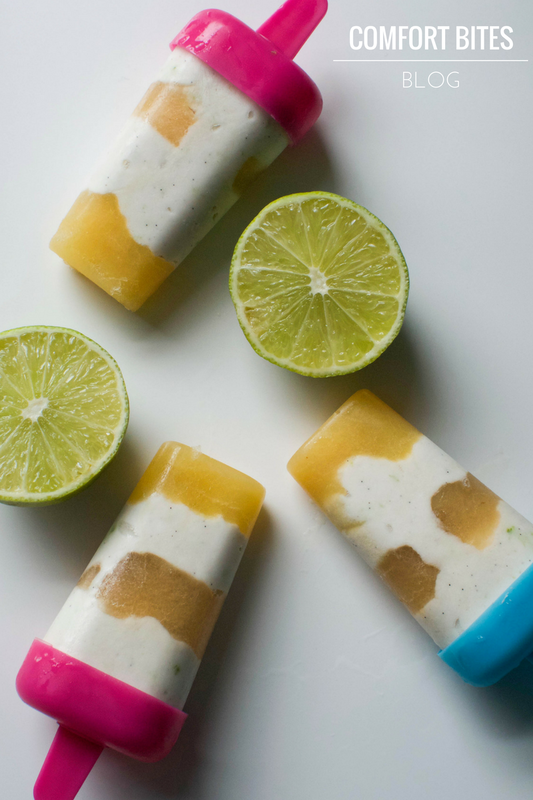 The lollies take literally maybe 2 minutes or less to put together, and then they're just chillin' in the freezer until your little ones want a sweet frozen treat. And these are good for dessert any time of the year. I've made them in mini moulds, just to give one little hit of sweetness, rather than a great big pud that even though it's natural, is still full of sugar. You can also tell by the flavour that these jellies aren't packed with added sweetener. They manage to keep the original flavour of the fruit, rather than a tooth-achingly sweet, brightly dyed version of it. What I'm trying to say is that it tastes authentic. Get out your mini lolly mould. Open the carton of coconut cream and let any excess watery liquid tip away - you won't need that. Tip and squeeze the coconut cream into a bowl and add the teaspoon of vanilla bean paste. Finely grate in the zest of the lime and mix together. Next, open up your pouches of jelly. Very carefully put one teaspoon of the coconut cream mixture into the bottom of each of the moulds. 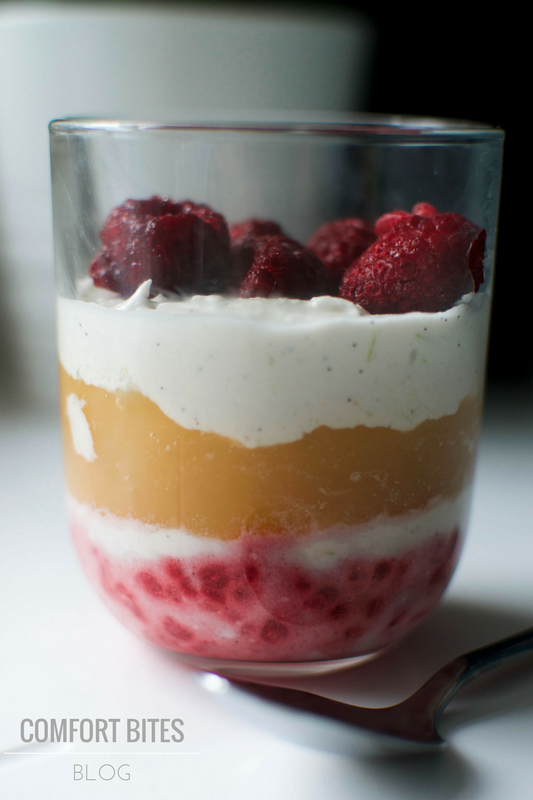 Squeeze in a little of the Summer Fruits jelly and swirl it around a little with the tip of a teaspoon so it's generally flat. Be careful not to disturb the coconut cream underneath. Add another teaspoon or so of the coconut cream and then squeeze in a layer of Tropical Fruits jelly. Finish with a topping of the coconut cream. Repeat for all the remaining moulds, pop in the tops with the stick and then slide into the freezer to set, about 2-3 hours. Once you're ready to serve, gently remove the lollies from their moulds - you can run the moulds under a little hot water from the tap to ease them out if you need to - and eat straight away. Whisk the coconut cream, vanilla and lime together exactly the same, as above, and transfer two tablespoons of it to another, small bowl. Crumble in 3-4 raspberries (I used defrosted frozen ones) and mash them up into the coconut cream until it's pink. Spoon this into the base of a shot glass. Next, spoon in a little more of the plain lime and vanilla flavoured coconut cream. The next layer is a good squeeze (about half a pouch) of Jelly Juice Tropical jelly. 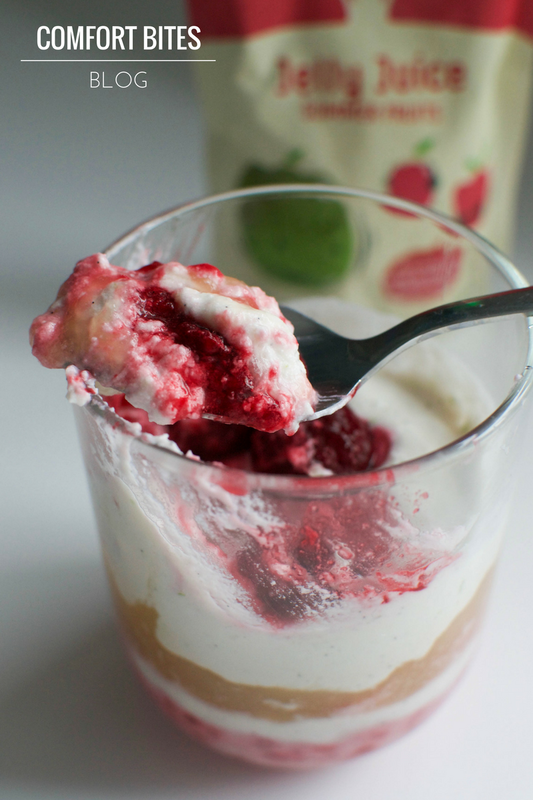 Finish off with the rest of the coconut cream mixture and then top with fresh or frozen raspberries. Chill, until ready to eat. For more details visit the Naturelly website. 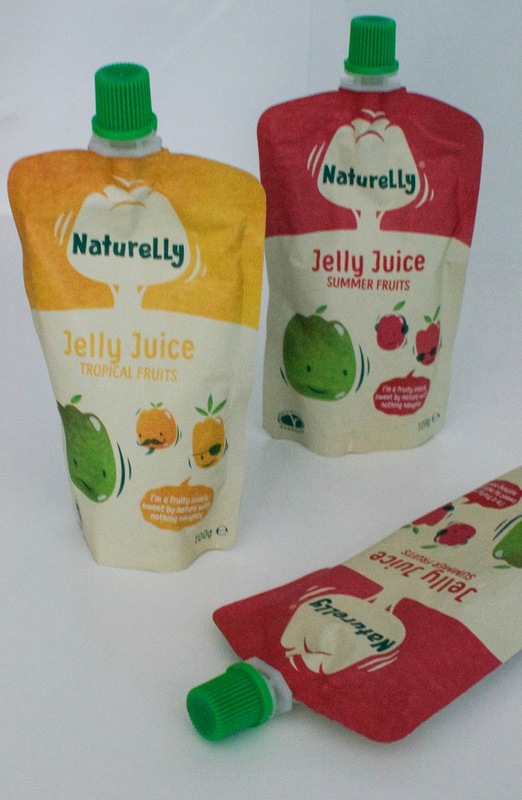 Have you tried Naturelly Jelly Juice? What did you think?